Learn how to use the Rustoleum Countertop transformation paint kit to transform your outdated counters. Plus a review of how the paint held up a year later! A kitchen renovation is a huge project. It’s expensive. It goes on for months. It leaves us with nothing to eat except pizza and microwavable meals. So putting it off until you are absolutely sure you know what you want is so wise. We don’t know what we want yet and we’re definitely not ready to dole out the money for it. 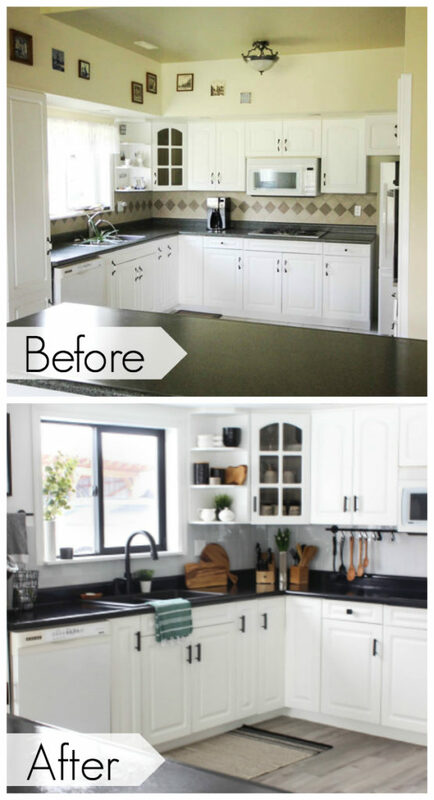 So we made a few temporary changes last year in our Weekend Makeover, and now I’m finally sharing our Rustoleum countertop transformation paint review. This was our kitchen when we moved into the home. Our long term plan in this outdated home is to build an addition in 5-10 years. The addition to the house would include a master bedroom and ensuite as well as a garage. It will cut into the existing kitchen, making it a good time for those big renovations. But I didn’t want to wait until then to touch the kitchen. I was itching to use some paint on those green countertops. As part of a weekend makeover project, we planned to revamp our kitchen in just three days. We painted countertops, added new peel and stick tiles, changed out all of the hardware, changed the sink, and added a new faucet and accessories. We somehow managed to get the entire kitchen done and the transformation was amazing! 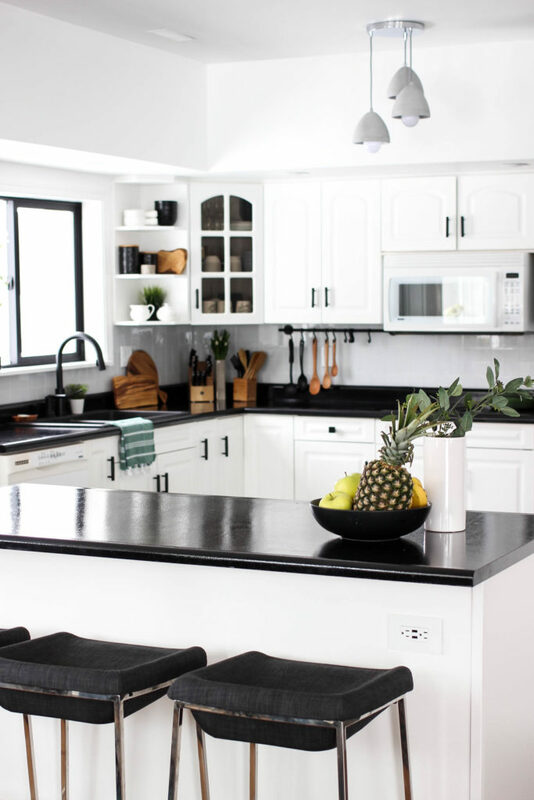 The newly painted black countertops was a huge part of that transformation. 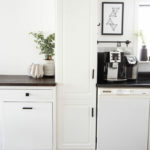 Countertop paint is a great idea if you’re looking to update laminate or arborite counters, but it’s not a permanent fix. 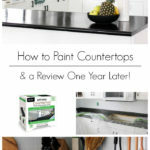 We’ve had these painted countertops for over a year now, and I’ll share my honest review of how they are holding up at the end of this post! How many countertop transformation kits do I need? A large rustoleum countertop transformation kit is enough to cover 50 square feet of countertop. We have a lot of counter space in our kitchen and one kit of countertop paint was exactly enough to cover all of the counters. If you are only doing a small countertop, it may not be worth it for you, because once you open the kit, you can’t save any and reuse it on another project later. It’s only good at one time, and it’s too expensive to use on just a small countertop. 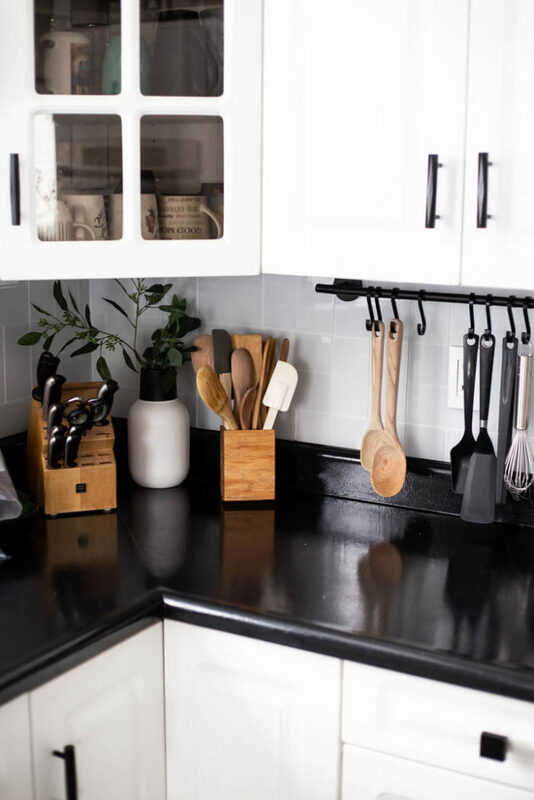 The countertop transformation kit comes with everything you need (except the face masks that I would recommend), and detailed instructions, but I’ll run through the process here too. Since we did this transformation as part of our Weekend Renovation on Instagram, we recorded the process of us adding the Countertop paint for the first time and shared it. Check out the “Kitchen Reno” highlight on our Instagram page to watch the kitchen transform. The process is fairly straightforward, but I’ll lay it all out for you here. Make sure you still read all of the directions that come in your countertop paint kit before you start though! If your countertops have any cracks or large chips, you’ll need to repair these before you use the countertop transformation kit. 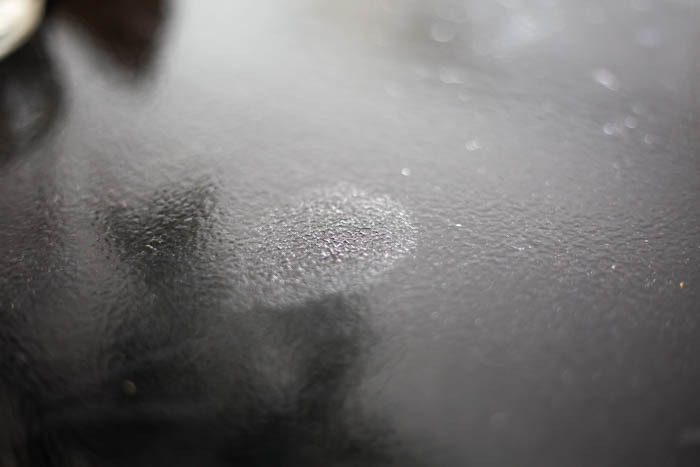 Use an epoxy putty to fix these areas because the epoxy you use on the countertops will be able to adhere to it (i.e. don’t use a wood putty or filler). You do not need to worry about small scratches or chips because these will fill easily. Once the repairs are done, completely clean all countertops with soap and water to remove any grease or debris. Allow the counters to dry before beginning the next step. Each kit comes with a diamond embedded sanding block that you use to sand down the countertops. Push down in a circular motion on all surfaces of your countertop. Sanding them gives the epoxy something to grab onto and stick to once you are ready to paint, so make sure that you sand all of the tops and edges of your countertops so that there are no shiny sections remaining. When you are done sanding, wipe down your countertops to remove all of the dust. We found Tac Cloths to be the best way to remove the dust easily. When all of the dust is gone, use painters tape to tape off any surfaces that you don’t want paint on. 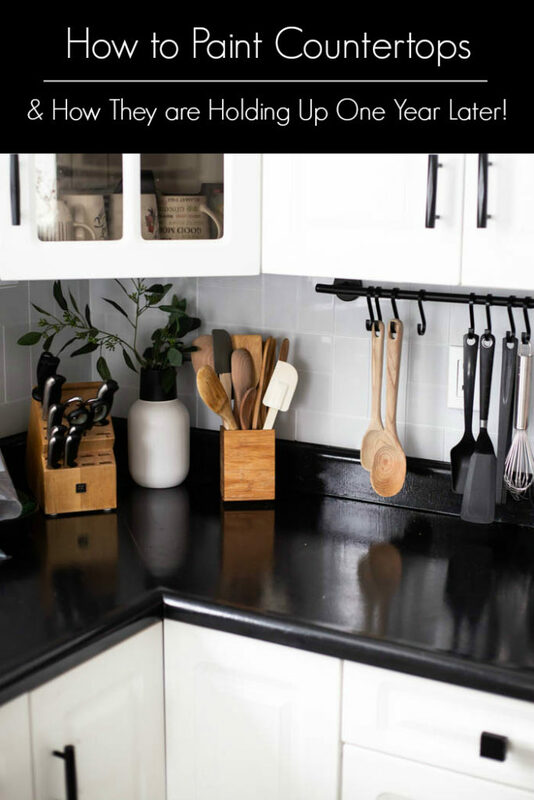 You can also use the painters tape to tape a drop cloth or protective sheet under the counters to protect all of your cupboards and appliances. 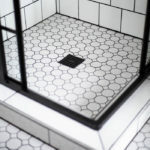 Cover any drains so that you don’t get any paint or particles in your drain either. If you are applying one of the countertop transformation paint kits that has decorative chips in it, you will have to mix that first before applying the base coat. If you are applying decorative paint chips, you will have to do this while the paint is still wet. Our kit did not have chips in it, so read your instructions thoroughly if you are completing this step. Next mix the base coat and apply it to your countertops. You will probably want a Face Mask for this as it is very stinky. Your Rustoleum countertop paint kit will come with a foam roller that you can use to apply the paint. Apply it smoothly and evenly on all of the surfaces. Any cutting that needs to be done (e.g. in corners or edges) can be done with paint brush. You can apply a second layer of the base coat after two hours. If you have any paint runs or missed spots, make sure to sand them down and fix them at this stage. After 12 hours, you can apply the top protective coat. the protective coat comes as a two part epoxy that needs to be mixed (an activator and a base). Once you mix this together, you must use all of it within 4 hours. Use the same process as above to paint it on. Using a paint brush for any cutting and painting any edges, and a roller the paint onto larger surfaces. We found that the roller that came with the kit was “shedding” and we ended up switching it out for some foam dollar store rollers we had on hand instead and were very happy with that. The little hairs in the first section of our painted countertop did not stay on forever, but they were very noticeable for weeks and I was very glad that we had switched rollers. Once you are done painting, make sure you don’t do anything that will create excess debris or dust in your kitchen for at least 4-6 hours. 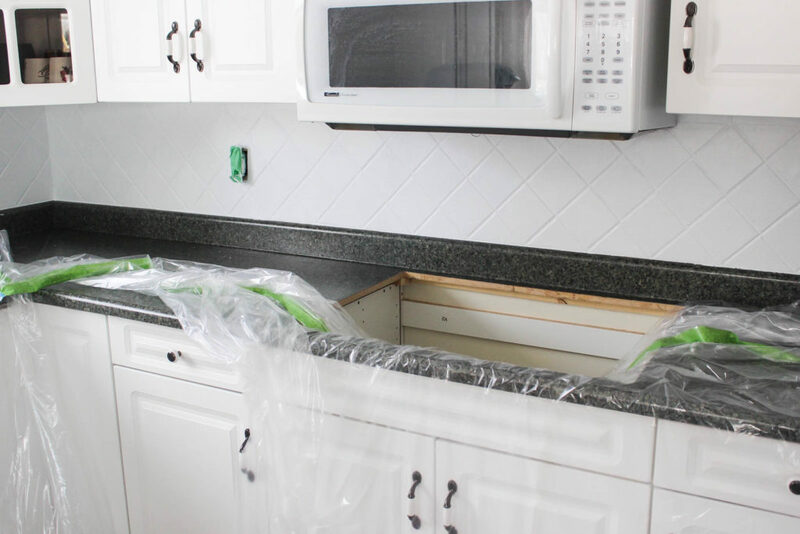 After that time, you can gently remove your painters tape and drop cloths, but be careful when removing the tape that it doesn’t peel any of the countertop surface with it. Avoid using your newly painted countertops for the first 48 hours. After that the kit suggests that light use is ok, but we actually put a small scratch in ours on the third day, so the longer you can let your countertops set, the better! Allow at least a week before resuming regular countertop use. Once the countertop transformation paint has cured, you can clean them easily with soap and water or a mild cleaner. Avoid anything too abrasive, as it could scratch the surfaces of your painted countertops. Avoid cutting directly on the surface of the counters so that you don’t scratch the countertop paint. Also, be careful what appliances you set on the counter, and consider placing anything with sharp edges or surfaces on top of a cutting board or trivets. Try not to drag anything across the countertop surface. How did the Rustoleum Countertop Transformation Paint Hold Up? We’ve had our paint on the counters for over a year now, and I wanted to share an honest review of how they are holding up, and whether or not we are satisfied with the results. The immediate results of the countertop paint were amazing! We had a ton of friends and family members come over that were surprised by how nice and natural the paint looked. The colour was beautiful, the finish was smooth, and the quality was excellent. But it is paint, and there are bound to be a few issues. It took me about 24 hours to add the first scratch to the countertop. To be fair… the kit says specifically to use lightly for the first week, and I was probably a bit heavy handed. But I did put a small scratch into the countertop paint right away. Over the course of the year we have put several scratches in the paint surface. Some because we were dragging appliances, or bowls with a little edge that caught the paint. Anything heavy and metal (e.g. a coffee machine or mixer) has a high probability of scratching your painted countertops. I have a wire basket that was sitting on the countertop collecting bills and paperwork, and I didn’t realize that every time it was moved around, it was also scratching the surface. So it will stay there until we touch up the paint, or completely redo the kitchen! 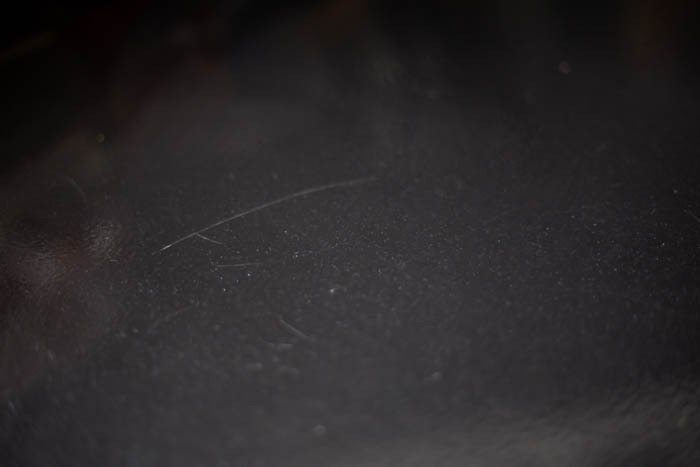 The beautiful thing about the black countertop paint, is that it hides the scratches easily. While we know where each scratch is, guests of ours had a hard time finding them, even when we pointed out that there were scratches to find. There is also one spot on our counters that has “reacted” in some way to the paint. I have no idea what happened in this photo below, but it seems like something got onto the surface of the paint and reacted to it, causing it to bubble. It’s just one spot, and I’ve never had anyone notice it (or at least mention it to me! ), but I always know it’s there! 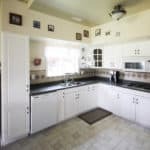 Would We Use the Rustoleum Countertop Paint Again? Short answer: yes. The process of applying the paint is very easy, and it made a HUGE difference in the look and feel of the space. I was so happy we did it when it was done. Over time, it has gotten more scratched, but honestly, I feel like for a countertop paint, it has held up really well. And this is just about the most traffic a countertop will ever see. I would definitely use this paint in a bathroom, or bar, or somewhere that doesn’t see as much traffic because I feel like it would hold up even better. 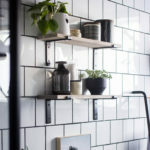 For a kitchen, it’s not a permanent solution, but it’s a great option for a few years. After that you can either buy a new kit and touch it up again (still way cheaper than new countertops! ), or buy the new countertops you’ve been saving for! 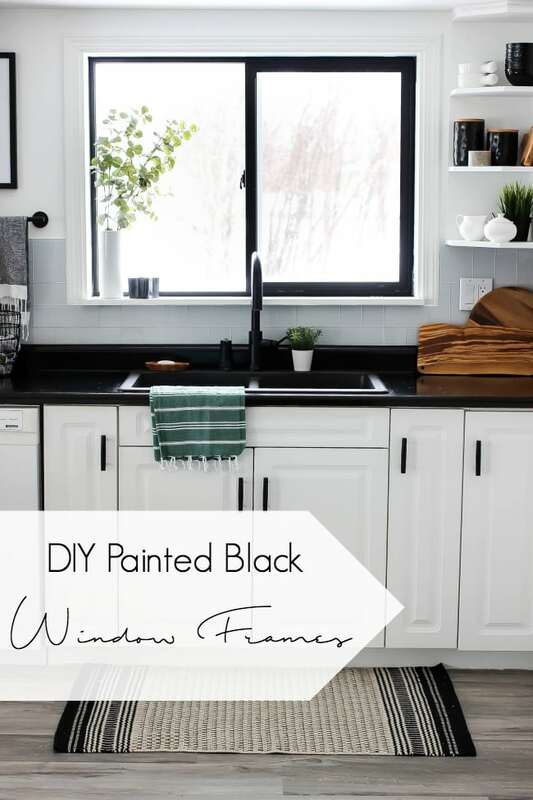 Another quick upgrade we did was painting our window frame in the kitchen black! 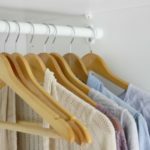 It made a huge difference, and was a very easy project to tackle!